Michael Boardman is Professor of Mathematics at Pacific University in Oregon where he served many years as chair of the Department of Mathematics and Computer Science and as the Chair of the Natural Sciences Division. He is the recipient of Pacific’s S.S. Johnson Award for Excellence in Teaching. 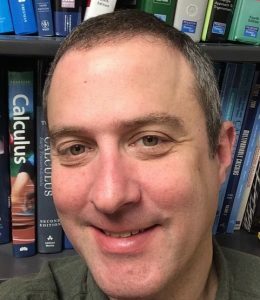 Boardman has been involved in AP Calculus for 25 years, staring as a AP Reader in 1994, and rising to the level of Chief Reader for the years 2008 to 2011. Boardman was the founding moderator of the AP Calculus Electronic Discussion group and continued in that capacity for a decade. He served for five years on the AP Calculus Development Committee followed up by four years on the ETS’s AP Calculus Workgroup. He has led APSIs across the country including in Alabama, California, Colorado, Massachusetts, and Washington state. Boardman is coauthor, with Roger Nelsen, of College Calculus, a second term calculus book for college students who successfully completed AP Calculus AB in high school, and is a co-author for the upcoming Sixth Edition of Calculus: Graphical, Numerical, Algebraic, by Demana, Waits, Kennedy, Bressoud, and Boardman. He currently serves as chair of the Mathematical Association of America’s Committee on the Undergraduate Program in Mathematics (CUPM), the body that publishes recommendations on curriculum for undergraduate mathematics departments. This course is intended for AP Calculus BC teachers. The purpose of the course is to deepen teachers’ understanding of the calculus included in AP Calculus BC (which includes AB topics), to help them understand and experience the construction of the AP Calculus exam and scoring rubrics, and to understand the process of scoring the AP Calculus exams. We will engage in discussions on classroom techniques that improve student learning and retention. We will review the Mathematical Practices (MPAC), Big Ideas, Enduring Understandings (EU), Learning Objectives (LO), and Essential Knowledge (EK) statements that comprise the AP Calculus AB curriculum. We will pay close attention to common student misconceptions and errors. Special emphasis will be given to more difficult calculus concepts and skills such as working with tabular data, functions defined by integrals, Taylor series, differential equations (including the logistic), polar and parametric functions. We will review the structure of the AP Calculus exam, how it is constructed and scored so that participants can devise their own AP-like questions and scoring rubrics to use in their own courses. Participants will be provided opportunities to share practices and activities that they have found to be successful in their own classrooms. These are the topics for the week. Inclusion of individual topics will depend on participant needs and the ordering is fluid. Introductions and Goal Setting: what do you want to achieve this week? How Much is Enough? When does a response deserve full credit on a problem? Creating your own MC and FR questions. The AP Calculus BC Exam: The process of constructing and scoring, and how cut-scores are determined. NOTE: A TI 84 graphing calculator will be used.